Over the weekend, we had the wonderful opportunity to spend some time together as a family. Instead of just sharing gifts on special occasions, I often enjoy giving our daughters tickets to an event or activity that we can participate in as a family. To celebrate our younger daughter’s graduation from Kindergarten at the end of May (yes, May! 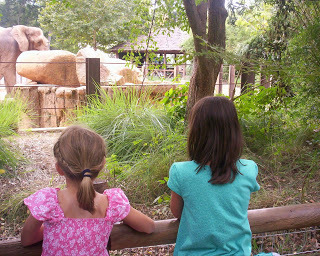 ), we had promised her a trip to the zoo. With the heat and other activities of the summer, it kept getting put off. However, since the girls got out of school early on Friday, we decided to take advantage of those extra hours and the cooler weather to visit the zoo. We were able to see many different animals. 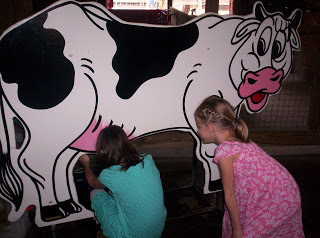 The zoo also has a petting farm and barn area where the girls got to milk a pretend cow. 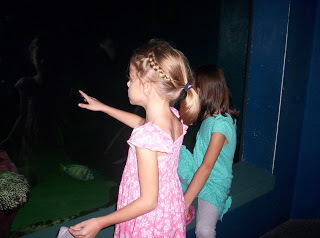 I think the girls’ favorite part was the Aquarium and Reptile Complex. On Saturday there was a fall carnival at their school, so we stopped by and watched the girls play some games and go on a hayride. I’m thankful that we were able to enjoy spending time with each other while making memories to look back on in the days to come! Sounds like a nice weekend. Looks like everyone had a great time! So much fun! I miss those days now that my children are older.